I can't believe I forgot to blog about our new 7 Nights Guide to Restaurants and Bars!! On May 16, we released the 2007-2008 print edition, which includes well over 600 Vermont establishments. We also did a major upgrade to our 7 Nights website. If you haven't already been to the site, you should definitely check it out. Wanna find every restaurant in the area that costs over $100 (there aren't many)? Or look for places in the Barre/Montpelier area that serve brunch? No problem. Plus, we have some coupons, a spiffy new slideshow and links to recent Seven Days food articles. One of the best things about the online guide is telling people what YOU think by writing comments. To comment on a restaurant, just find its listing in the guide and click on "add your comment." As for the paper version, it's great to keep in your car for those "where the heck am I gonna eat in Marshfield" moments. On my way to an interview this morning, I stopped in at Viva Espresso and snagged a fruit smoothie. ..it was delightful. The smoothies come in berry, mango and strawberry/banana flavors, and can be made with milk, soymilk or organic yogurt. I had the berry made with soy and was quite pleased. I also found that Viva's now offering local egg sandwiches made from Lucky Lady eggs and medium Cabot cheddar on Myer's bagels! I'd already eaten breakfast, but I felt it was my obligation to try one for the sake of my blog readers...somebody's gotta do it! The flavor of the cheese was a bit overpowered by the herbs on my bagel, so next time I'd probably opt for sesame instead. Other than that, it was great. They heat the sandwiches on a panini grill, and mine was nice and hot when it was delivered to my table. Guess I'd better skip lunch today! Gotta run to my interview now...more blogging later! Remember the Simpson's episode -- One Fish, Two Fish, Blowfish, Blue Fish from season 2 -- in which Homer chowed down on a piece of poisonous sashimi and was later told he had only 24 hours to live? Something similar recently happened to a couple of people in Chicago. Except that unlike Homer, they consumed the seafood in a soup. And they had no idea what they were eating. It's the most recent in a string of discomforting news about food -- including the infamous wheat gluten used in pet food -- imported from China. It seems that a few boxes labeled "monkfish" may actually have contained some type of poisonous "pufferfish" instead. The FDA has confirmed that the fish contained tetrodotoxin, the substance that makes creatures in the Tetraodontidae family (yep, like pufferfish) dangerous to humans. The affected seafood was sold in Chicago, Illinois and Hawaii, so we're probably safe up here in the Northeast. But if for some reason you find a box of fish in your fridge that reads, "“MONK FISH GUTTED AND HEAD-OFF PRODUCT OF CHINA." and “Ingredients: Monk fish; Imported by: Hong Chang Corp., Santa Fe Springs, CA 90670; Product of China (P.R.C. ),” don't eat it! The MSNBC article is called "Two Sick in Suspected Pufferfish Poisoning." If you're the kind of person who enjoys chocolate martinis and fancy truffles, the Stoweflake is the place to be this weekend. They're hosting the 1st annual Vermont Chocolate Show, complete with activities for youngsters, chocolate art and of course, lots of treats to try. Seven Days will be there -- it's the first in a series of food-related summer events that we're attending. We'll be handing out copies of our new 7 Nights Guide to Restaurants and Bars and chatting with folks about fun food stuff. I'll be there most of the day Saturday, but won't on Sunday. On Sunday, I'll be watching my sister's boyfriend run the marathon -- he came in 17th two years ago -- he hadn't planned to run, and hadn't trained for it at all. Last year, he came in 7th. I've watched the marathon for years, but this makes it so much more exciting. So, if you see the guy in the photo run by, yell, "Go Jon" for me! Back to chocolate for a second...if you're looking for a chocolate extravaganza, you'll want to go to New York in November for the Chocolate Show. That one even features a chocolate fashion show, go figure! This is my response to a letter to the editor we ran in last week's paper. My goal in writing this response is not necessarily to change any particular person's mind about the project. However, it is very important to me that folks understand my intentions, whether or not they agree with my approach. Passages in bold are from the letter. "Suzanne Podhaizer's experiment in buying organic/local/natural foods with the money allotted to food-stamp recipients seems patronizing, disingenuous and naive..."
Naive I can understand. At the end of the week, I found I'd been unable to meet my caloric needs on the diet I came up with. I was also exhausted and hungry. This would have been doubly true if I had a teenage son who eats like my teenage brother, and so on. People who get food assistance are in such varied situations that no project could ever capture all of the complexities. I tried to do my best to raise some questions. This is the reason I framed it as a project and not a prescription. Disingenuous, no. There was nothing insincere or hypocritical about my intentions. I blithely recommend local and organic foods as solutions to numerous social ills (petroleum usage, illnesses caused by the spraying of pesticides, cruelty to animals on factory farms), but I've never tried to purchase said foods on such a small budget. The natural/local/organic "food stamp diet" was conceived of as an experiment -- to see if I could make the choices I deem so important if my circumstances were different. There are folks on food stamps that attempt to keep kosher, buy halal foods or practice vegetarianism or veganism. Can they meet their caloric needs while still meeting their moral obligations? If not, what needs to change? Also, the prices of many processed foods don't reflect their true cost (to human health, to the environment) in part because of government subsidies and economies of scale. If those are the calorie-dense foods that prevent people from being hungry on the budget provided to them by the government, we have massive systemic problems. Should folks on food stamps have the option of buying fresh, pesticide-free produce and animals that weren't raised in squalid conditions? If so, what needs to happen to make that possible? Getting an EBT card reader at Farmers' Market might be a good start, more subsidized CSA shares throughout the state would be another, a greater number of free cooking classes would be a third. Patronizing. I didn't intend it that way. If I'd tried to purchase duck or truffle oil, I believe that would have been patronizing. This wasn't about choosing fancy food, it was about choosing food that is nutritious and doesn't have such a high cost to other humans or the environment. I was eating couscous, beans and brown rice, foods that are staples in much of the world. Since I can't accurately emulate anybody else's situation, I lived as I would try to if my financial situation changed. I certainly found a bunch of ways in which I would need to compromise. "Moreover, City Market, where she shopped, is exclusively and prohibitively pricey for many in Burlington." As I mentioned in a response to another blog comment, I lived in Burlington for many years without a vehicle, so I know what it's like to only be able to shop at City Market or coordinate taking a bus to another grocery store. I generally walked home carrying my groceries, which necessitated almost daily trips to the store. As I also mentioned in that previous comment, for at least two and maybe three of those years, I would have qualified for Food Stamps, but I didn't know it at the time. I'm not sure if we're running it this week, but City Market sent us a chart that provides the prices of staple foods at City Market versus other grocery stores. Many are comparable. Not all are. If it doesn't end up in the paper, I'll put it up on the blog. "She omits spices from her total cost, which is absurd. Pound for pound, they are among the most expensive grocery items..."
Throughout the week, I used approximately 10-20 cents worth of spices. The only ones I used were cinnamon, nutmeg, and pepper. Although spices are expensive per pound, a very small amount is needed to have an impact. I ate a pound of cabbage in one week. It would likely take me a decade to use a pound of spices. Had I done this project for a month, I would have been able to save on a few items, such as cheese, potatoes and carrots, by buying larger packages for less money. The leftover amount would have been enough to buy a month's worth of spices. Doing this for a week created additional limitations, but because of professional obligations, I knew I couldn't participate for a month without dining at restaurants. "Many poor people also lack the leisure and culinary expertise of Podhaizer. The expectation that people under economic duress will adapt recipes from the Joy of Cooking is improbable, if not ludicrous." The letter's author has no information about how much I work or what my financial obligations are like. Thus, commenting on my leisure level seems inappropriate. I do agree that I know a lot about cooking. That was one reason I limited myself primarily to recipes found in a book that hundreds of thousands of American families own (it has been in print continuously since 1936, and more than 18 million copies have been sold, says Wikipedia), that is in almost every public library, and which has simple, easy to follow recipes for staples and casseroles. Over the course of the week, adapting recipes meant things like making oatmeal with water instead of milk, so I wouldn't run out of milk. I didn't do anything fancy. I didn't use any fancy equipment. There are also programs in our area such as Healthy City and Cooking for Life, which are geared towards providing education and resources to folks who would like to learn about cooking and nutrition. The more programs like this our community can foster, the better. "When I think of my working mother coming home exhausted, dealing with kids, the house, bills, etc., and then presumably whipping up a loaf of oatmeal bread...I don't know whether to laugh or cry." Without getting too deeply into my family situation, I will say that I have two siblings, and my mom consistently works more hours than anybody else I've ever met, seven days a week. She has also prepared dinners from scratch ever since I can remember. She bakes bread, makes pizza dough, soaks and picks through dried beans, etc. There were times in my life when she earned the sole income for our family and still did this. That doesn't mean everybody can, but it's what I grew up with and how I learned to do things. I confirmed with her that during certain periods, she was feeding us on less than the "food stamp diet" allocated amount for a family of our size. Sometimes people bake and forage because they have the leisure to do so and they find it fun. Sometimes they do it out of necessity. My mom is lucky in that she happens to find baking pleasurable, too. I wanted this project to be a learning experience for me and a thought-provoking read for others. My love for the Burlington Farmers' Market is so great that I teeter on the edge of bathos when I attempt to describe it. So I won't. I will say that I'm having lots of fun reconnecting with the farmers/vendors and with fellow customers I haven't seen for a while. I will also mention the new format, in which vendors are spread out across the park instead of facing each other across narrow sidewalks. I think it's a great improvement. The market is now more wheelchair and stroller accessible and feels expansive in a way it didn't before. Here's a list of the produce I've seen so far: asparagus, spinach, scallions, carrots (overwintered), chives, thyme, microgreens, lettuce and wild mushrooms. On Saturday afternoon, I whipped up a dish to bring to my sister's college graduation party. I took two bunches of Pomykala Farm's asparagus, chopped it roughly and sautéed it in olive oil: I always throw the big pieces from the bottom of the stalks into the pan first, then add the mid-sized pieces a minute or two later, and finally, throw in the tips. I finished the asparagus with salt, pepper and a couple squeezes of lime. Then scooped on a good amount of Doe's Leap chêvre. It was simple and yummy, and disappeared pretty quickly. Unfortunately, I'm going to miss FM this weekend. I have an obligation in Stowe beginning at 8:15 a.m. on Saturday. 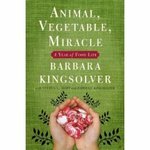 The book tells how Kingsolver and her family moved across country to live in a place where they could grow much of their own food (they couldn't do so in Arizona, where they lived previously). They garden, buy from local farmers and generally spend a lot of time examining American foodways and philosophies. The few pages I've read so far are peppered with shocking facts and beautiful prose. On the first page, Kingsolver writes, "The tall, dehydrated saguaros stood around all teetery and sucked-in like very prickly supermodels." What an apt and evocative description -- I can't wait to read more. So, about that poll...I created it because I was surprised, almost shocked, at how much weight I lost over the eight days living on a food stamp budget. I lost 6 pounds. Experts suggest losing no more than one to two a week through diet and exercise. I hardly exercised, so that was almost entirely through calorie reduction. Basically, this means that I was not able to meet my caloric needs on the diet I created. There were some days that I was so hungry I couldn't concentrate. Other days I had plenty of food. It all depended on how much protein I had available. I also didn't bake bread. Since I don't own any loaf pans (and certainly didn't think it would be acceptable to buy them), I'd intended to construct them out of tin foil, but I never ended up making the time -- so I did without. The week I was doing the food stamp project, I worked approximately 70 hours (60-70 is typical for me). I was usually so ravenous when I got home from work that I'd make whatever was simplest and then crash. That was part of the reason I did this...to see what it was like. And hopefully to make people think a little bit. It was certainly a learning experience. There are still a couple of posts I want to write about it, but I haven't had time. Maybe this weekend. Overall, 48 people voted. 4.2% thought I'd gained 8 pounds. 25% thought I gained three pounds. 35.4% thought my weight would stay the same. 34.5% thought I lost 6 pounds. Today seemed like a good day to create my first poll! My last day before I'm allowed to buy more groceries. Breakfast: Polenta (or cornmeal mush) with cheese. Lunch: Leftover lentil stew and tomato couscous. Dinner: Barbecued baked beans, brown rice with cheddar, pickles that have been in the fridge forever. The baked beans came out pretty well. I made the barbecue sauce out of most of a large can of tomato sauce (which I bought for the project). I'd used a little bit in the tomato and cheese couscous the other day. I mixed that with molasses, a little Worcestershire, a bit of cayenne pepper and some apple cider vinegar. Not bad! I'll be posting about the project at least a few more times. I'm going to do a summation and also respond to one of the angry letters I received and which we ran in this week's paper.